Cryptococcosis is an infection caused by the fungus Cryptococcus gattii formerly known as Cryptococcus neoformans var gattii. The airborne fungus is found in the tropical and subtropical climates of the world. C. gattii can infect the lung or the central nervous system. It can also affect other parts of the body. The symptoms depend on the part of the body affected. Symptoms can develop between two to thirteen months after inhalation of the fungus. 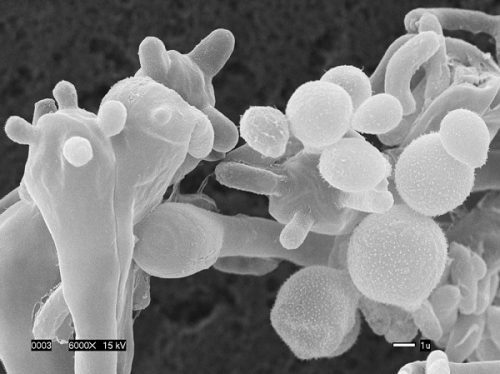 Inhalation of the airborne C.gattii fungus from the environment. The fungus can be found in the environment, in the soil and trees in tropical and sub-tropical regions of the world (Australia, Papua New Guinea, Africa, Asia, Europe, Mexico and South America). In the united states, C. gattii has been found in Washington, Oregon, California and Hawaii. There is no human to human or human spread of infection. Animals can become infected. The infection cannot be spread between humans and animals. Infection is only via inhalation of the yeast cells or spores. Diagnosis is based on clinical symptoms, travel history to endemic regions, medical history and laboratory diagnosis. A tissue or body fluid sample (blood, cerebrospinal fluid or sputum) can be tested for antigen and also cultured for the fungus. Additionally, a chest x-ray or CT scan of the lungs, brain or other parts of the body can be helpful in the diagnosis. Antifungal treatment is available. Generally, the recommended treatment is fluconazole for mild infections and amphotericin B in combination with flucytosine for severe infections and those infections in the central nervous system. There is no immunity to this disease. C.gattii fungus can be isolated in the soil and around trees in the environment. There is a risk of humans and animals becoming infected from inhalation of dried fungus cells or spores. Those with weakened immune symptoms, predisposing respiratory conditions, elderly, smokers are at increased risk of becoming infected with the fungus. There is no preventive treatment. People may breathe in small amounts of fungi but never become sick. If you suspect you may have Cryptococcus gattii, you should see your healthcare provider as soon as possible.